This bar, hidden in the upstairs of the Village Yokocho restaurant, only allows parties of 4 or less. You can sit at the bar or asked to be seated. 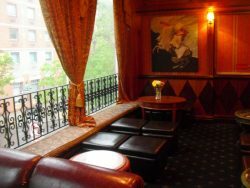 You will be able to have a view St. Mark’s Place and realize that you have walked, but never knew this bar ever existed. The Whiskey drinks are strong and the sweet drinks are delicious. One of my favorites is the Cheek to Cheek, which is a dessert-type drink that tastes like raspberry cheesecake in a glass. The best thing is about this places is that you can order fried Oysters and Japanese snacks at the bar. The bar is located inside the popular hole in the wall hot dog restaurant called Crif Dogs. Once you walk into the small restaurant you will see an old phone booth to the left. This is actually the entrance to PDT. Pick up the phone and let girl how many people you have with you and she will let you in. If you want, you can make a reservation for a table in advance by calling first. The added bonus of being at PDT is that you can order hotdogs from Crif Dogs and they are delivered to you. Secret phone booth entrance and hot dogs, what more can you ask for? The most amazing thing about this place is the mixologists and the drinks. The ingredients are house-made and infused. There are tons of sofa’s to sit on and feel free to relax to some early American Jazz. Yes, there are live bands! A password is required which you can get by subscribing to their site. Dress up! 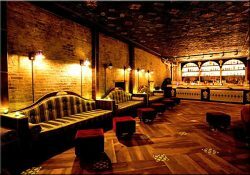 This location is very much like a speakeasy, but without all the rules. All you will need to do is to be able to locate the place. You will walk down the stairs to an underground restaurant/bar. To your right you have the option of sitting down and eating a meal or you can go to the left which is the bar area. 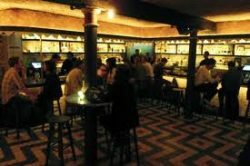 The bar area always has great Spanish music playing from a DJ or a Live Band. I would say that if you are in the mood for some Salsa Dancing and Mexican food and a drink than you have found the right place. The front entrance is a small gate that reads “Lower East Side To Go”. Open up that gate and walk down the dark hall. You will not find any sign of a bar or club, so keep walking to the end until you find a stairway on the right. 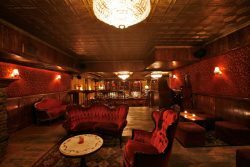 This will lead you to a door that you will open up to a 1920’s themed room and if you are lucky enough, you will catch a performance with people dressed in character. It is such a great experience that brings you right back to the prohibition era. And it's not fake! This place really was around in the 1920's! This place is easily missed. 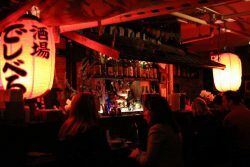 The most interesting thing about Sake Bar Decibel is the Japanese dungeon-like atmosphere with graffiti on the walls. Sure you can order a lychee martini, but they offer hundreds of Sake to choose from. They have a wide variety of snacks, but an order of edamane or chips will be perfect with your drinks. 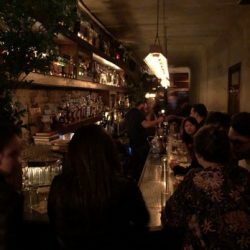 Fabric coasters, friendly bartenders, Bluegrass on Mondays and Wednesday - and highly rated in the area for their great cocktails. A tip here is to tell the bartender what you like and don't like and let them go to town! 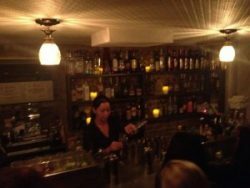 Like Attaboy (next on the list), this bar has it's pedigree in the beloved Milk & Honey. Attaboy is the everyman’s cocktail bar hidden in plain sight on an obscure bit of Eldridge Street. 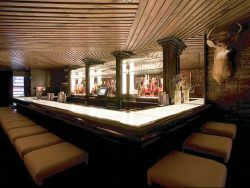 From Michael McIlroy and Sam Ross, the pair that helmed Milk & Honey throughout the late aughts, this understated beauty is the younger, less self-conscious sister (Read: A bit rougher on the edges) that took over the space when M&H moved uptown.